'Margarita Pearl' is one of the few ELAN 310 in Australia and is a great example of a fast 30ft cruising yacht or racer. Launched in 2012 she has been meticulously maintained by her experienced boat owners and is now for immediate sale. The ELAN 310 is a versatile yacht by well known boat designer Rob Humphreys. 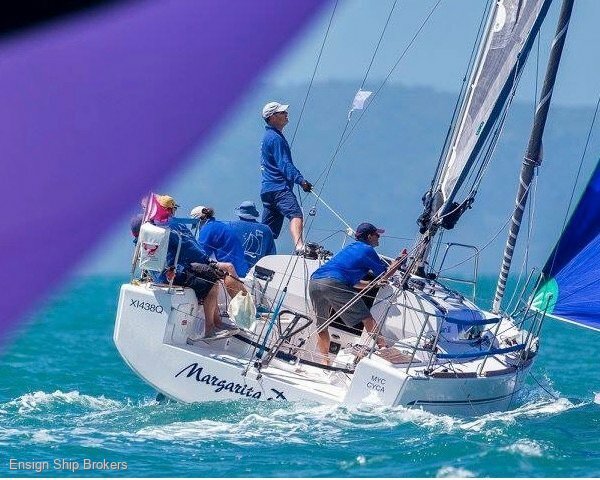 The David Lambourne rig with double swept back spreaders, new Quantum Main, jib and sleek hull shape will give you the edge on your race competitors. The roomy aft double and big V-berths, airy saloon and good sized aft toilet and shower room provide all the cruising comforts. Port side galley has a deep chest fridge, stainless steel sink and good cupboard space. Add to the gear a heavy duty Raymarine autopilot connected directly to the steering quadrants, lazy jacks and furling headsail and the package is complete. Additional sail wardrobe includes a OneSail main, jib, spinnaker and asymmetric spinnaker. Deck gear include quality fittings, Harken winches, Carbon spinnaker pole and a retractable bow pole - ready to compete. Sailors looking at Sydney 36, Elan, Bavaria, Beneteau, Jeanneau, Farr designs should check this yacht out first. Covers Boom tent, Boat cover, Main sail cover, Winch ahts, Headsail cover. Cabins Large double and Forward V-Berth, Convertible saloon. Galley LAYOUT: Portside short L-Shaped. STORAGE: High and low cupboards. Sail Inventory Quantum GLP Light skin carbon Main & Jib, Spinnaker, One Sails main, New North #4 Jib, Asymmetric spinnaker. Mast / Rigging RIG TYPE: Fractional sloop with swept back spreaders RIG AGE: 3 Years FURLER: Yes LAZY JACKS: Yes SPARS: Aluminium mast and boom, Carbon spinnaker pole. Deck Gear New Mast Dyform Rigging 2015, Aluminium Bow Pole, Harken & Spinlock deck gear, furlex underdeck furler.